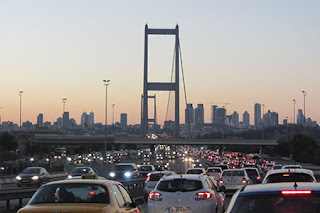 Istanbul is really really easy to negotiate and is perfect for foreign tourists to get around. 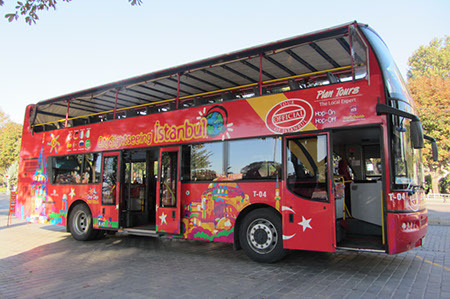 They've invested significantly in their public transport and have one tram line that takes you through the majority of tourist landmarks including the Galata Tower, Blue Mosque and Haag Sofia. Even more perfect for me my hotel (the Holiday Inn) was also on the line meaning that I had no issues getting about at all. Obviously for the park tour I'd chosen to use a dedicated driver, which was pricey but got me where I needed. Some of the parks can easily be reached on the public transport if you don't fancy the expense of the card and driver. 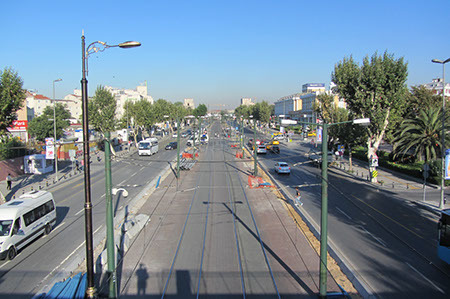 As well as the cost another advantage is that for the most part the trams and metrobus have dedicated lanes that mean they can get about quicker than the cars can. With the metro you pay to enter the transit network and not where you wish to travel to, so this means a flat 3TL fare regardless of distance. 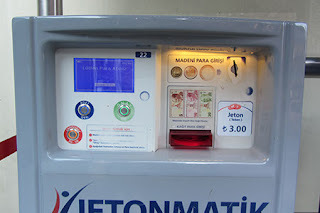 You need to purchase a token to get through the turnstile and the machines are usually very close to the entrance although at some stops you need to cross over to the other side SultanAhmet in particular was catching a lot of people out. There are no interchanges where lines cross which means you leave the station on line 1 and then have to buy a second token to enter line 2. A metro map, which can be found at most stations. 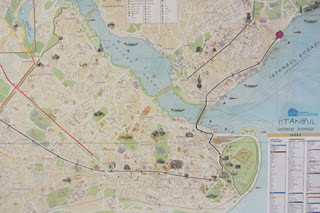 You can see the blue line is the tourist tram line and it runs past most of the main attractions in the city. Another way to get around is by bus but these looked a bit chaotic for me so I didn't give them a go. You basically look at the signs on the front that say where it started and where it finishes, and if you're lucky they'll also list some of the key stops along the way. There are no bus stops from what I could see instead if you want the bus you hail it, jump on and then do the same to get off. I'm sure I'll be corrected if I've got that wrong. I'd heard bad things about the taxis in Istanbul in that they will try tricks to get more money from you such as not running the meter, quoting lira then demanding euros and the like, so I wouldn't recommend using them unless you've done all you can to ensure you're not going to be ripped off. Having been royally screwed by the drivers in Bucharest I know how much of a downer this can put on a trip and I wasn't prepared to risk that again. The city has 2 airports Ataturk and Sabiha Gokchen From the former you can catch the metro to get into town. From the Sabiha airport there is a Havatas bus service that can bring you into the centre of town stopping at Tacsin Square for only 12TL. This worked superbly with them waiting for you immediately outside the airport and then getting you into town in a little under an hour. This was the method I took and I definitely rate it, so much in fact I ended up using them in Ankara and Antalya too. Just check the bus is going where you want, throw your bag in, jump on and give the collector the money when he asks for it, then sit back and relax. Jump off when you see everyone else jump off. There are a couple of stops first where one or two people might jump off. Stay on until you reach the square. From the square you can catch the metro but given I'd landed at 5am and was in the town at 6 I was a little early for the metro to open so instead I just took a casual walk down to the river's edge and went for a morning stroll...perhaps making that decision was also due to the lack of sleep. I never think straight when I've been awake for ages. Crossing the Bosphorous by car. Expect some build up of traffic during rush hour. 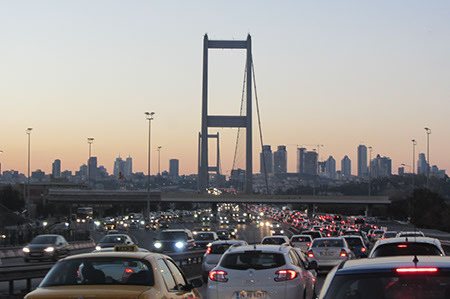 You might not expect a view that makes you think you're in the US rather than Istanbul but that's what you'll get. For those who are time-strapped then I recommend the red bus (there are yellow and blue rivals but red is best). For 20euros they can give you a fairly conclusive tour around Istanbul in 90 minutes with optional extras of a night tour and a trip into the Asian side. They advertise that they start the tours from 9am but check if you're hoping for that on a weekday. They chose to start at 10 on the Monday, the one day I didn't have a window for a late start. C'est la vie!